At the George Observatory and just about anywhere else people gather to look at the night sky, Saturn’s rings are among the most popular and most captivating sights. Their significance, however, goes beyond the beauty that might jumpstart a lifetime of interest in astronomy. Studying and understanding the rings has been an ongoing affair, a reminder that science does not proceed to the ‘right answer’ and stop, but always continues as new questions are raised. Although astronomers began to understand the rings of Saturn in the 1600s we’re still not quite done learning about them. Many of us are familiar with tides. We know that just as Earth’s gravity pulls on the moon, the moon’s gravity pulls on the Earth. Seas rise and fall due to the moon’s influence (and, to a lesser extent, the sun’s), causing high and low tides. But tides affect solid material too. For example, tidal attractions from the Earth de-spun the moon until it began to rotate (spin) at the same rate at which it orbits Earth, thus keeping the same face to Earth. This effect, called tidal locking, has occurred with all other large moons in the solar system. For any given massive object (for example a planet) and satellite (a moon) in orbit around it, we can define a limit, called the Roche limit, inside of which the tidal forces from that object would tear the satellite apart. A large moon orbiting inside the Roche limit will be destroyed. The Earth’s Roche limit is 18,470 km (11,470 miles). If our moon ever ventured within this Roche limit, it would be pulled apart by tidal forces and the Earth would have rings. The four gaseous outer planets do have their rings systems inside of their respective Roche limit. The four gas giants (Jupiter, Saturn, Uranus, and Neptune) each have material inside of their Roche limits; this is why they each have rings while the smaller inner planets (Mercury, Venus, Earth, and Mars) do not. Of the gas giants, Saturn happened to have the most material inside of its Roche limit, and therefore has a more elaborate set of rings than the others do. The rings of Saturn are 73,000 km wide but only 10 meters thick. They are not solid; many NASA spacecraft (see photos from the Cassini spacecraft taken this year) have flown right through them several times without incident. The particles in the rings, made of mostly water ice, range in size from 1 cm to 10 meters in diameter. Saturn has seven rings designated A-G, along with a Phoebe ring identified by Cassini in 2009. Note that the order of the rings from inside out is D-C-B-A-F-G-E; the rings were named in the order they were discovered. When you look at Saturn through a ground-based telescope, rings A and B are most apparent (with A on the outside). These rings were visible to Galileo, although his crude telescope in 1610 could not quite resolve what they were. In 1655, Christiaan Huygens was the first to describe the rings as a disk around Saturn. In 1675, Giovanni Cassini discovered the gap between rings A and B now known as the Cassini Division. Any particle orbiting here would align with the moon Mimas every other orbit. This makes such an orbit unstable, resulting in the gap. The much dimmer C ring inside of the B ring is harder observe; William and George Bond discovered it in 1850. Rings D, E, F, and G were unknown until the mid to late 20th century. Still the question remains, how long has Saturn had its rings? The initial assumption was that the rings formed with the planet and the rest of the solar system 4.6 billion years ago. That is, raw material too close to Saturn was unable to accrete into a moon due to excessive tidal forces. Or, a small moonlet happened to orbit within the Roche limit, and was pulled apart due to these tidal forces. However, scientists struggled to explain why the rings, made of 99.95 water ice, remain so bright. It seemed that after 4.6 billion years, the ice particles in Saturn’s rings would have gathered so much dust as to appear dark (like the rings of Jupiter). Instead, Saturn’s rings are bright enough to significantly enhance Saturn’s brightness; Saturn is over 2.5 times brighter in our sky when the rings are fully open to us than when the rings are edge-on. In calculating how long it should take infalling dust to darken Saturn’s rings, scientists revised their estimate of the rings’ age; many considered them to be only about 200 million years old. By this estimate, the rings would have come into existence about the time the first dinosaurs thrived on the Earth, long after Saturn and the other planets had formed. However, the favored explanation today is that the rings resulted from the disruption of a moon slightly bigger than Mimas (about 400 km in diameter). Impacts capable of breaking apart moons of that size were common during the Late Heavy Bombardment about 4 billion years ago and have been much, much rarer since, so it seems likely that Saturn’s rings are about that old. Further, we have observed that at times ring material can clump together and then be dispersed by collisions. 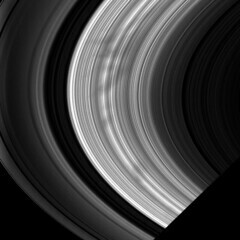 This process, in which ice not exposed to infalling dust is periodically re-released, could account for the continued brightness of the rings. Originally slated to end in 2008, NASA’s extraordinarily successful Cassini mission to Saturn has been extended through 2017. As it began near Saturn’s equinox (2009), when the sun was directly overhead at Saturn’s equator and thus in the ring plane, the extended mission is called the Cassini Equinox Mission. The new science objectives for Cassini’s extended mission include making measurements of the rings’ mass by having the spacecraft orbit in between Saturn and its innermost rings. Scientists will be able to observe how much Cassini deviates from an ideal orbit around Saturn, and thus estimate the mass in the rings. This, in turn, will help us resolve the mystery of their origin. Image of Saturn taken by Voyager one in 1980. To find Saturn in our spring 2010 sky, face southeast at dusk. Earth aligned with Saturn back on March 22, putting Saturn in our sky all night long. Since then, Earth has moved out of alignment with Saturn, such that the ringed planet is no longer up all night but is instead high in the evening sky and more convenient to observe. Although it is getting slightly dimmer each night as Earth moves away from it, Saturn still outshines most stars in the sky. Saturn remains in the evening sky, shifting slightly towards the west each night, through September 2010. 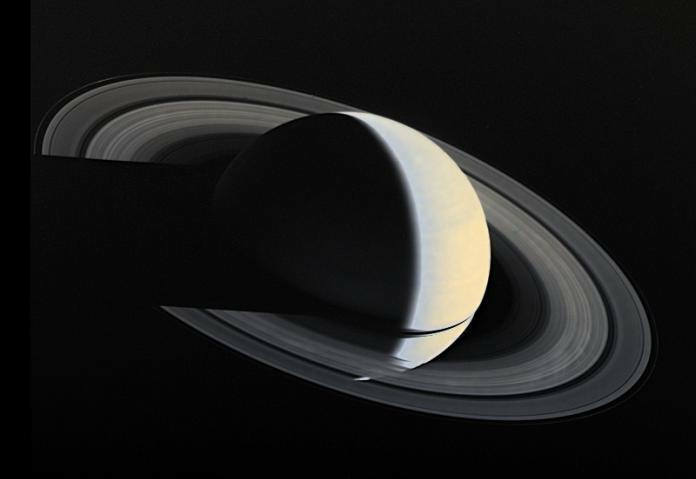 If you look at Saturn through a telescope this month and next, you will have a chance the see the rings as thin and edge-on as they’ll be for the next 15 years. Earth was exactly in the plane of Saturn’s rings in September 2009. However, Earth and Saturn were also on opposite sides of the sun at that time, so none of us could see Saturn then. In spring 2010, Earth once again approaches (but does not quite cross) Saturn’s ring plane. Thus, this April and May you can watch the rings of Saturn get slightly thinner each night, appearing thinnest in late May. Usually I don’t learn post on blogs, however I wish to say that this write-up very compelled me to take a look at and do it! Your writing style has been surprised me. Thank you, very nice post.